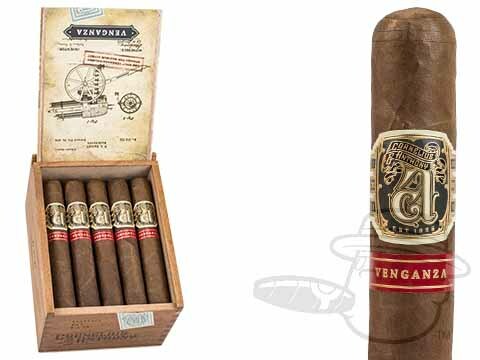 Boasting a slick and spicy Ecuadorian Habano wrapper over burly Nicaraguan binder and filler tobaccos, the Cornelius and Anthony Vengaza presents a powerful smoke with the imposing tasting profile to back it up. Solid notes of cedar, pepper, espresso, and a rich leather swirl around in a mosh-pit of mouthwatering complexity, accompanied by a lingering coffee-and-cream sweetness that punctuates every puff. The Vengaza made its way onto the “best of” lists of many upon its release in 2016, and rightfully so. It’s not often that a cigar this strong can pull off this kind of nuance and flavor diversity. It’s action-packed, but never insults the palate with brute force. Add a batch of these smooth criminals to your cart and experience full-bodied perfection today.